HacKIDemia, along with a few other organizations, was invited by the Singapore Science Center, to support a Maker Faire booth at the EduSave merit bursary award function for the Tampines Community Center on Jan 17, 18 and 24. The awards are given to Singaporean students from relatively lower income households who have excelled in academic and co-curricular activities. The objective of the Maker Faire booths was to inspire students and parents to create, tinker and unleash the inner maker in them. A few of the HacKIDemia mentors Luther, Fazli, Balaji, Sabri, Syahmi, teamed up with Science Center mentors Lin and Jordan to facilitate the HacKIDemia tables. We chose simple but free-flowing making activities with pipe-cleaners, paper, tape, LED lights, flat circuit tapes, and vibrating motors. 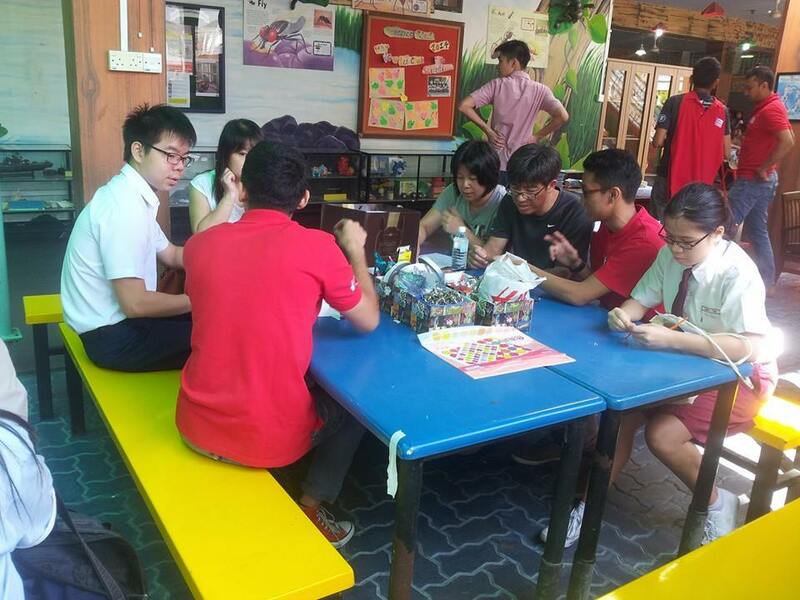 Since this was the first time our team was organising such activities in the heartlands of Singapore, we were unsure about the amount of interest and excitement we would be able to generate. We are highly energised and humbled by the enthusiastic response we got. Students , parents and even grand-parents spent significant time making, learning and bonding as a family. We had participants come back again for a second day just to spend time making at our booth because they enjoyed it so much. Have a look at some of the fun stuff our participants and mentors made. The chief guest of the bursary awards, Mr. Heng Swee Keat, the Hon. Minister of Education for Singapore, dropped in a few times to the Maker Faire booth. He appreciated the positive feedback he got from the community members on the fun they were having making things and commented on the 'Hands-on Learning' approach he got to observe. He also invested time to sit and make an LED-powered flower for his wife! In total, we estimate that we reached around 200 participants across 3 days and many of them have asked to be kept informed of future opportunities to make. The event was an additional proof point of the latent need for HacKIDemia's philosophy of learning through making. For the mentors, it was fun to get to work with a broader community of makers like Playeum, Just Love Crafts (who had an awesome quilling workshop) and learn new things from them. Thanks to all the mentors at the Maker Faire booths and to the Science Center for providing us an opportunity to contribute to the community.